Yoshi about to throw an egg at the last card, which will give him ten extra lives. Match Cards (or Match in Yoshi's Island DS) is a Bonus Challenge which requires memorization in Super Mario World 2: Yoshi's Island and its remake, Yoshi's Island: Super Mario Advance 3. The player will be shown fourteen cards at the start, and they will have to match them after. If the player makes one mistake, then the cards the player chose will get flipped over again. If the player makes two mistakes, then the player will lose this Bonus Challenge, but he/she will keep whatever was grabbed along the way. If the player chooses six pairs correctly, the last two will become two 10-Up Cards. In the DS remake, each match is worth a 1-Up, and if successful, the player will earn a 16-Up for all seven matches. 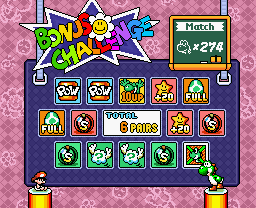 This Bonus Challenge is similar to the N-Mark Spade Panel minigame from Super Mario Bros. 3. This page was last edited on April 12, 2018, at 08:23.